THERE is a lot more to staying competitive in the packaging business than simply producing boxes. Just ask Teckwah Industrial Corp.
Executive director Ng Nai Ping contends that innovation and thinking - well, out of the box - are the keys to success in a market that is becoming increasingly competitive while also facing many other challenges. Part of that innovation comes in the form of moving towards incorporating multimedia into its packages. Its "intelligent boxes", for example, will help track buyers of the products and capture sales data. Teckwah's information technology department has also developed an augmented reality mobile phone app for a food and beverage manufacturer. If a customer scans a package, the firm's mascot pops up on his phone - all part of a promotional contest organised by Teckwah, with cash prizes on offer. All this marketing is very new for the 46-year-old firm, Mr Ng admitted. "We are still crossing the river by feeling for stones." The print and packaging industry faces shrinking orders as many manufacturers move out of Singapore. In some sectors, the market for packaging has practically disappeared, Mr Ng said. "Sectors like pharmaceutical and nutrition, which we started focusing on three years ago, can still survive. But for consumer goods like hairdryers, or even IT products, which can now be bought online, packages are no longer needed." Mr Ng said the firm realised about three years ago that it could no longer continue to depend on these big manufacturers. Competition is also keen, with packaging firms from China and Malaysia fighting for customers as well. "We had to move up the value chain." Teckwah decided to invest across the Causeway in Iskandar in order to fight the labour crunch and rising business costs here. It now has three factories there, bought in a single purchase three years ago. This is in addition to a subsidiary company in Batam set up in 1996 with three factories. It employs more than 400 people here and about 800 overseas. Iskandar is now its production base for high-volume printing, although Teckwah's Singapore office handles customers for the Asean region and focuses on digital printing, which has a quick turnaround time. The trend towards multimedia also prompted it to build Pixel Red, a five-storey building in Tai Seng. In addition to IT infrastructure, the building, which Teckwah moved into last month, has a number of small business units Teckwah hopes will be taken up by other firms it can collaborate with. "We would like advertising agents, event organisers to move in. We may even consider forming strategic partnerships with some of these companies to help them grow," said Mr Ng. "Pixel Red is a solution for the future of the print industry, not just a production base." It has hired a new five-man marketing and development team to back its foray into offering marketing solutions. It is also working with a consultant in Britain. Next up could be personalised gift products - packages that "help the customer make the orders more creative, like personalising a cake box", said Mr Ng. Teckwah's paper-based products, including packages of polyethylene terephthalate (PET) and wax paper, cater to manufacturers mainly from the IT, pharmaceutical and nutrition, consumer electronics, and food and beverage sectors. Print and packaging accounted for 60 per cent of the company's overall revenue in the first quarter of this year. The segment's $22.8 million turnover was down 7.3 per cent from a year earlier. 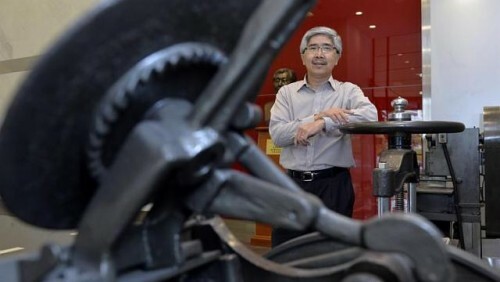 Operating profit before tax of the print-related business also declined by 66.6 per cent to $500,000, which Mr Ng attributed to start-up expenses from relocating its production facilities and lower demand. The other 40 per cent of revenue was from its logistics arm. Mr Ng said doing business in Singapore is "never easy". "I can enjoy good results this year, even the next, but everything could change in the third year. "But we want to deliver good results, and have put in a lot of resources to restructure. We believe the future of the packaging business is moving in this direction."